As a Retirement Planner and Wealth Advisor, Rao Movva has a commitment to add financial value to his clients. Rao has gained his life and work experiences in two different continents, on the stock exchange floor and through financial planning, retail and private banking platforms. With his business acumen developed throughout many facets of the financial sphere and his client relations, Rao understands the unique situation of each high net worth and ultra-high net worth client. Rao works collaboratively with private clients, their advisors, and both internal (TD) and external specialists to achieve his clients' financial goals. 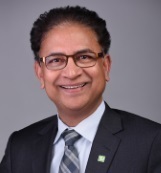 Besides being in the financial service industry for over 20 years, Rao has continued his education and achieved several designations, including Financial Management Advisor (FMA), Personal Financial Planner (PFP), Canadian Investment Manager (CIM), Canadian International Wealth Manager (CIWM), and Fellow of Canadian Securities Institute (FCSI) from the Canadian Securities Institute. In addition, Rao has completed a Bachelor's Degree in Social Sciences (B.A.) and a Bachelor's Degree in Law (B.L.). A resident of Etobicoke, Rao is actively involved in many charitable causes within the community. When Rao has a spare moment, he likes to travel, play tennis, jog along the lake shore, and enjoy family road trips. Rao is an experienced financial services professional and will work with you every step of the way to help you progress towards achieving the goals and dreams you and your family share for your work, career, well-being, home, lifestyle and legacy.